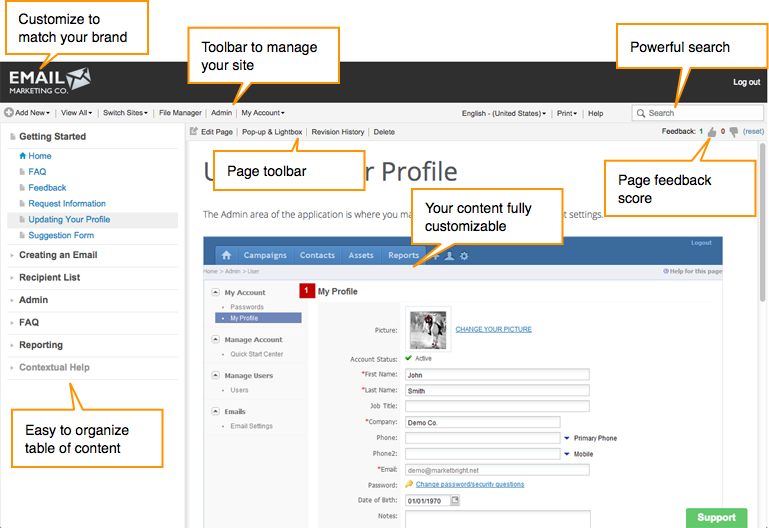 The screenshot below explains the interface and various menus that appear once you are logged in to your ProProfs Account. The header will contain the logo and a link to log out. You can customize the header by uploading your own logo and header background image. You can even use your own navigation header by pasting in your own XHTML/CSS. This will give your site a seamless look. Learn how to customize the header. Add New - Drop down to add a new item. New page - will add a new page and create an entry in the table of contents (TOC). You can drag and drop the page to the desired location in the TOC. See pages. New Folder - This will add a new folder in the TOC. 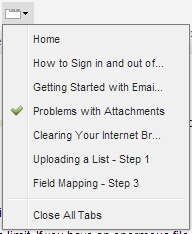 You can drag and drop the folder to the desired location in the TOC. New Tooltip - This will open a window to create a new tooltip. See tooltips. Tooltip Help - Opens a page that displays a grid listing all of the tooltips. It also allows you to create, edit, and delete tooltips. Switch Sites - If you have created multiple documentation sites, you can use this drop-down to toggle between your different sites. This will ONLY appear when logged in. 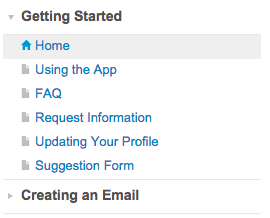 Settings - Link to the Settings section of the application. From there you can customize your sites, manage users, and manage billing information. My Account - Link to edit your account, including your name, email, and password. The table of contents is a hierarchy of the pages, folders, and sub-folders for a site. See the full description of the table of contents. Each page will open in a new tab. Tabs can be turned on or off for each site you create. See the full description of tabs. Print - Will print the current page. Views - Allows the user to change between tabbed view and basic view (no tabs, one page). Users can change their own view. You can also set the default view when editing your site. Tab Control - The tab control allows users to select from opened tabs or close all the tabs. Edit Topic - This will open the page for you to edit and publish. Pop-up & Lightbox - will open the option to embed the page as a pop-up or lightbox on your own website or web application. See the contextual help. Revision History - This will open a full revision history of all edits and changes made to a page. Delete - This will delete the current page. A confirmation message will appear that you must confirm that you want to delete. The keyword index will contain a list of "indexed" pages. When adding new pages, users can choose whether to include the page in the index and specify an index name. The index will list the pages in alphabetical order (ABC). See the full description of the keyword index.